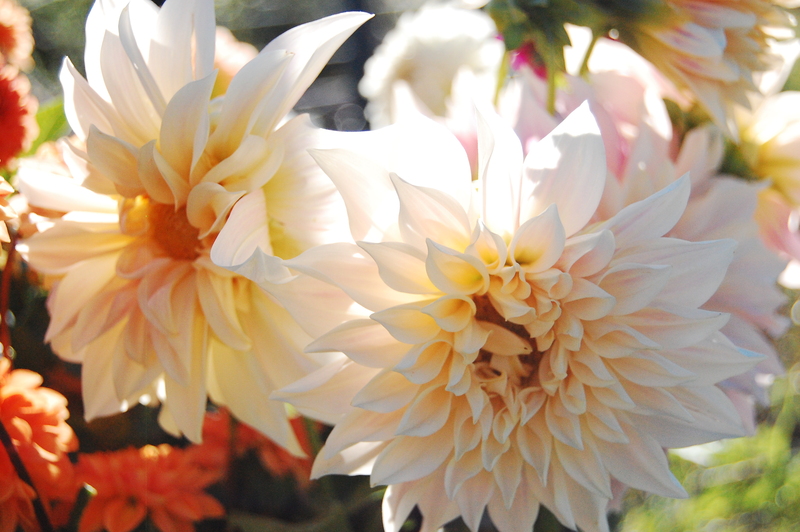 We were taken aback this year by the pests feasting on our garden. We’ve laid out the list before: armyworms, cabbage worms, cross-striped cabbage worms, aphids, and several unknown caterpillars. We even saw a wooly bear caterpillar, the cute harbinger of winter, devouring our salad mix. Such a small caterpillar, and the leaf was disappearing before our eyes! But by far the worst pests have been deer and cutworms, and this week we took steps that will help us control both. 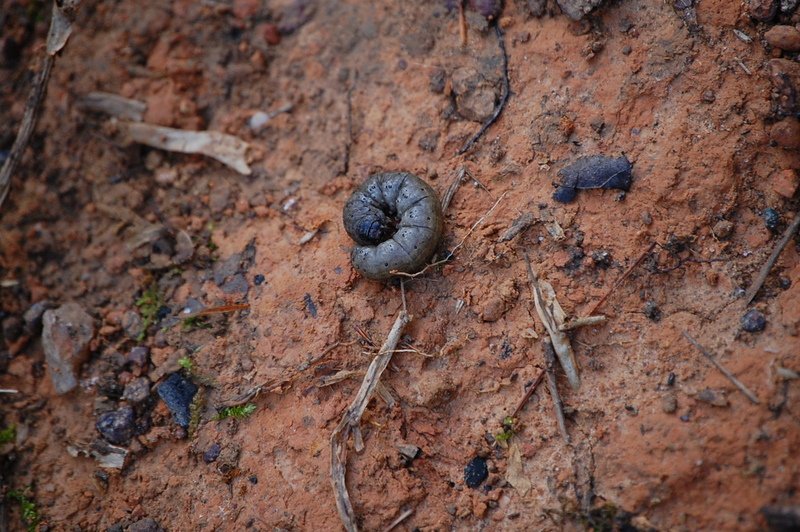 The cutworm is a grey-brown caterpillar that lives a couple inches below the ground. It emerges at night and immediately begins mowing its way through your garden. Unlike other caterpillars, which eat leaves, the cutworm snips off the stem. For plants such as greens, which only have one stem, this kills the plant. For plants that make a rosette of leaves, such as carrots, this may set the plant back severely or it may kill it. 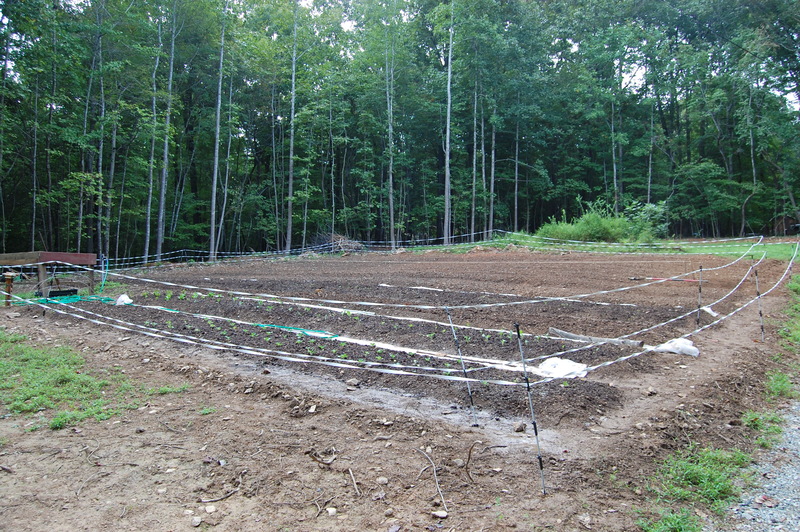 Because a single cutworm can do so much damage, and because they hide underground and blend in with the soil, cutworms are serious pests, and they did a huge amount of damage to our garden. 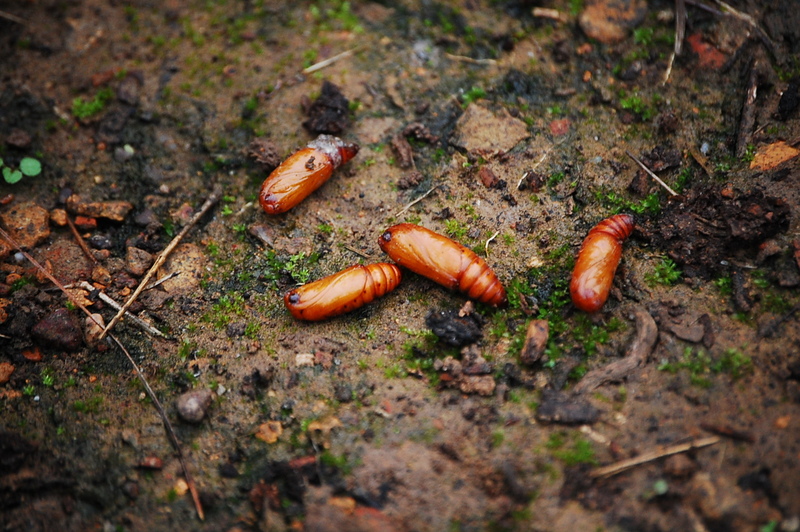 But while we were raking up our beds, we discovered that cutworm pupa are in fact easy to see: they are orange cocoons that lie a couple inches underground. So it was with some excitement that we picked out and squished dozens of them. I’m not at all ashamed to say they made quite a satisfying “pop.” This may not have saved this year’s veggies, but we’ve already taken care of many of next year’s cutworms by squishing them now. Our first deer fence: Not up to the task. Our original fence was also too short, and the step-in posts didn’t work for the corners. .So we beefed it up. Our new corner posts are taller and stronger and hold our fence high. We’re also pleased with our solar charger, which was putting out its full 8,500 volts along the entire fence. Our new fence is five feet tall. The chicken wire in a hasty anti-rabbit measure. We’ll install it properly when we have some time. The corners are T-posts which hold it taut. The two layers confuse the deer, which have poor depth perception. And when they touch this apple-scented caps with their noses, they learn to stay away from the strands. We’re still learning and still have a lot to learn, but we’ve done a lot to reduce the pest burden we’ll have to deal with next season. This is so informative. I had no idea these critters existed, and that you could take care of them with squishing the pupae. I’m not going to lie, that sounds a little interesting! We certainly hope that our strategy works. We won’t know until next year, I guess, but hopefully we’ve eliminated a lot of our problem. Great writing, Jonathan! I could feel your excitement at popping those pupae! Megan will remember as a kid helping me with garden chores. One daily chore was to search out and pick ravenous tomato horn worms off of the tomatoes and sacrifice them on a stone altar by smushing them with a hefty rock. Megan, as I recall, thoroughly enjoyed this garden murder, while her younger sister did not at all! Love learning from you all! The new fence looks fantastic!! I too, have had my fair share of satisfaction from the “pop” of japanese beetle larvae before they have a chance to destroy my flowers. 🙂 Keep up the good work!